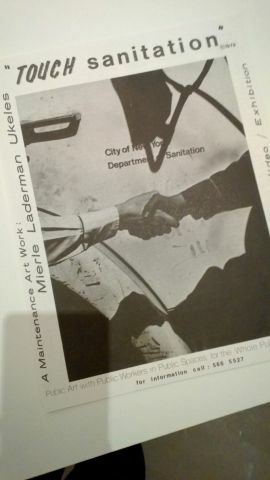 These are the opening words to Mierle Laderman Ukeles Maintenance Art Works exhibition at the Arnolfini, Bristol. In 1969 Ukeles fell out of the art world when she became a mother. In order to combat the oppositions between art and life she wrote the Manifesto for Maintenance Art. It was her re-positioning into art, highlighting the everyday and questioning what is defined as ‘work’ or a ‘role’, culminating in a body of perfomance work. The exhibition contains documents and photographs that archive the Maintenence performances in a layout that can be described as ‘dry’, or as though the original intention was for these works to be presented within a book. The experience would be exactly the same, except you could be sitting down instead. Presenting an archive in the context of an exhibition needs more effort in preventing a stagnant environment. Two video’s of Ukeles most well known performance, Touch Sanitation are presented in an individual manner. Television, headphones, chair, viewer, and in this the impact of the piece as public art is lost. Yes these are videos of a moment in time, a ‘one time performance’ but this is what remains, therefore the viewing of these videos could have been presented in a more centralised, shared atmosphere. She saw meeting new people as a scary, dangerous prospect, as though these people are a different species, staring at her, but then everything turns out okay. She is fine and well treated. Sanitation workers are people too, who would have thought. Its seems that Ukeles entered the project with stereotypical views, placing herself as the ‘upstairs’ to their ‘downstairs’ it begs the question who was this really for?